This is just a sample of the 1st page. If you would like the full outline, email me at lifesjourneytoperfection@gmail.com or leave a comment below with your email address and I will send it to you. So, once you've wrote the questions and assigned the question to a child. You will need to ask the children the question, I have done this a few different ways. One way, is during class time I have gone into the classes and asked them their questions and wrote down their answers. Once they have given you their response, it is really easy to write their part. For example, if the question was, "Who did you live with before you came to Earth?" and the child's response was, "Heavenly Father and Jesus." 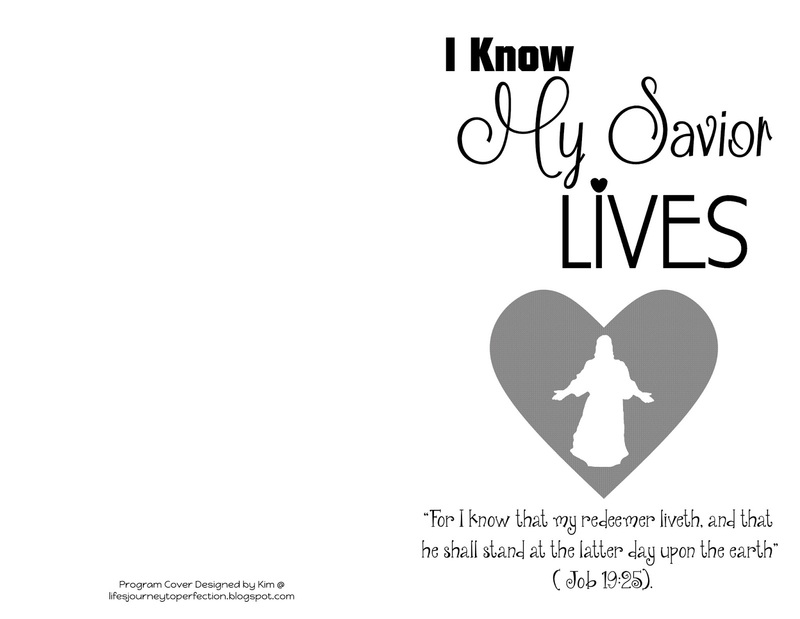 Then their part would be, "I lived with Heavenly Father and Jesus before I came to Earth." Or "Before I came to Earth I lived with Heavenly Father and Jesus." Another way I have done this, mostly with the kids I didn't catch in primary was I sent a text or email to their parents with the question. Music.... Boy I love music, it brings the spirit into the room, especially when those beautiful children sing. Their testimonies just radiate as they sing the songs!! The best thing I found was the primary presidency coordinating with the primary chorister. Together decide on what songs you are going to sing, how many verses of the songs you are doing to sing and if their are any special arrangements. We always tried to use our primary children's talents. We had violins, harps and cellos. You have to work with what they feel comfortable with and what sounds good. Sometimes it is they are just playing the interlude, or a verse by themselves. Or sometimes it sounds great for them to play along as the children sing. You just have to find what works. We also usually included something special in our songs. One year the children learned sign language to one of the songs. Another year they learned the first verse of "I am a Child of God" in Spanish. We have had songs where we had parts where the girls sing, parts where the boys sing, parts where the teachers sing, or even a class or group of kids sign. Don't feel bad about not singing all of the verses. We had one year where the plan was to sing all of the verses of a song and then we got into practicing it and decided that we would only sing one verse instead, and it turned out great. More about music... make it fun!! The best times my kiddos sang was when I made it fun. Some ideas, several times I would wear my super singer detector glasses (silly glasses) and have a pair of some other silly glasses. During the song, I would look for the primary child who was singing the best, this meant they were singing every word of the song and singing loudly (beautifully, not yell singing). Then that primary child would get to wear the silly glasses through the next song, when I would detect another child and the glasses would be passed on. Another time, I had a construction hat and pieces to build a temple. On the temple pieces were the songs. We would start with one and then while we sang that song I would be looking for the best singer that could help me build another piece onto the temple. I can tell you those type of things really get the kids singing!! Handing out Parts!! The best way I found was to staple all of the children in the same family together. I usually had a little note attached that said when we would be practicing, when the primary sacrament meeting program would be, and an invitation to the parents to help their children learn their parts. Then I would give their family bundle TO THE PARENTS!! I also e-mail the program parts to the parents also. Send reminders via email and text, reminding them when the program is, etc. The reason why I have the teachers reading the scriptures, is so the teachers can lead their class up to say their parts. It really helps so much with the flow of things. Then the teachers also lead them back to sit down. When to practice??? What I have found that worked best for our primary was we help practice during sharing time or class time on Sunday. For example: Junior primary is in sharing time first and Senior is is class first. The first week of practice, everyone would meet in the chapel or if the chapel is not available, then they would meet in the primary room for practice during the first hour. Then during the second hour, Junior primary would have sharing time and Senior primary would have Class, or vice versa. Then next week it would be opposite. You just have to find what works for your primary. I found that 3 practices were ideal. 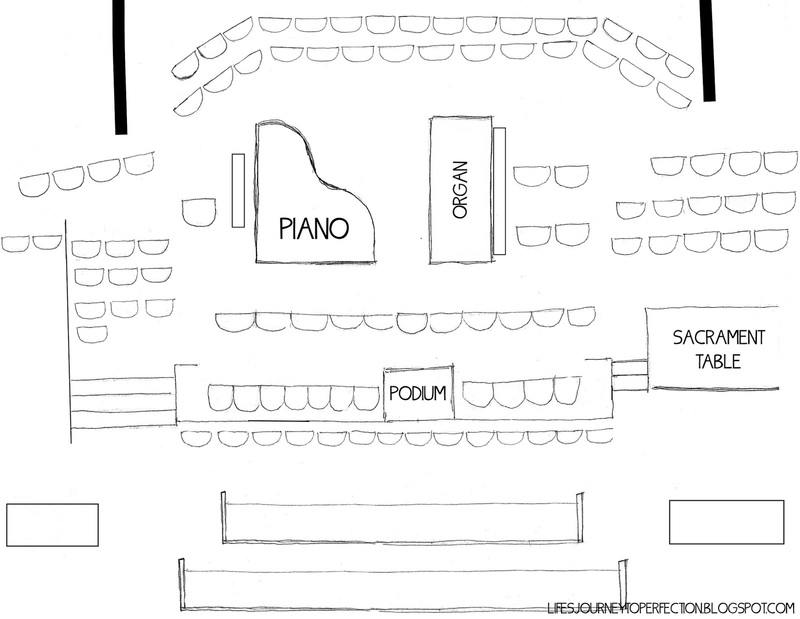 The first practice is many spent finding where everyone sits and running through the songs. The next two practices are spent doing a complete run through. There were some Sundays where we practiced the whole time and didn't have class or sharing time. Again whatever works for your primary. Why not a practice during the week??? I found that the kids as well as the teachers have very busy lives!! It was hard to get everyone their during the week. DO NOT GET DISCOURAGED, from the practices!! It is a proven and known fact that the practices have not refection on the program ;) Come program day, those little angels are going to shine!! After typing up the script, I give a copy to each of the teachers, music leader, pianist, and primary presidency members. I write their name at the top and highlight when their part and their classes parts come up. 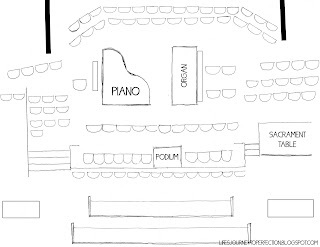 Also stapled onto the script is the seating chart as well as typed up words to the songs. The teachers loved having the words to the songs. It is really easy to do as well. 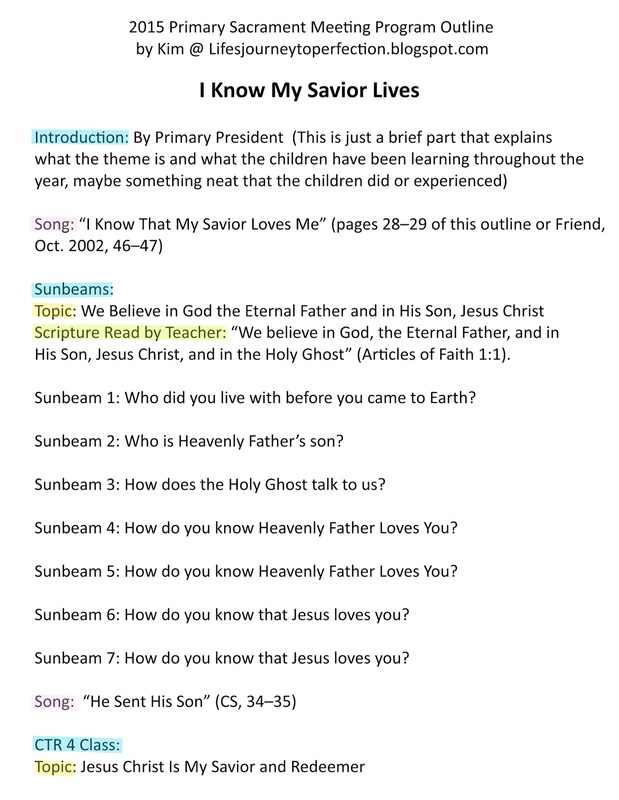 Just look up the songs on lds.org and cut and paste :) Here is the link to the test for the songs in the Children's Songbook. Thank Katie!! I emailed you the program outline, let me know if you have any problems or if you don't receive it. Hi Kim, I would love a copy of the program also. tislakis@gmail.com I am hoping to do something entirely different this time around and your idea is just perfect .You are truly a blessing and help to me. Thank you. I would love a copy of your program. Thank you very much!! Thanks Cheri!! I emailed you the program outline, let me know if you have any problems or if you don't receive it. Thanks Heath!! I emailed you the program outline, let me know if you have any problems or if you don't receive it. I'd like a copy as well. Thanks so much for all the tips and info. It's so great of you to share. My email address is smashley120@hotmail.com. Thanks Ashley :) I emailed you the program outline, let me know if you have any problems or if you don't receive it. I would love a copy of the program also. tanbowers@hotmail.com I am going through chemo and your ideas help me so much when I am not up to getting things together on my own. You are truly a blessing and help to me. Thank you. Thanks Tanni!! Your comment means so much! I am so sorry for the trial you are experiencing, prayers are with you :) I emailed you the program outline, let me know if you have any problems or if you don't receive it. Thanks Stacey! I emailed you the program outline, let me know if you have any problems or if you don't receive it. Thanks Jessica! I emailed you the program outline, let me know if you have any problems or if you don't receive it. yes please!! Please email it mrsbigbore@yahoo.com.. Thanks for all your hard work...EVERY week. Done :) Sent you the e-mail thanks for the comment! Yes! Pretty please!! I would love to see your primary program! I absolutely love your website. Thanks for doing all that you do!! Thank you so much!! You are so sweet :) I've sent you an email. K Ashley it's been sent to you :) Good Luck! Thanks Nicole! I sent you an e-mail. Thanks Bobbie- I just sent you the email. Thanks Michelle! I know how big primary's go :) We did a program a few years back with over 160 kiddos! :) I've sent you the email feel free to modify it to your primary's needs. Good luck! As I new primary president, your blog has become my go to resource for sharing time. Thank you for all your hard work. Please email me a copy or your program at larissa.moon@gmail.com. Thank you! I would love some help writing the program ( I have never done it before!) My email is simonewhitney@q.com - Thanks so much! Great blog! Thank You!! I have sent you the program outline in an e-mail. Thank you Lisa. I've sent you an email. Thanks Ashley you are so kind :) I've sent you an email. Thank you Fernanda! I've sent you an email. I would like a copy too. camilew@gmail.com Thanks! Hi Kim, I'd love a copy of your primary program. Thanks so much for doing this. This will help our ward (along with many others) out so much. Please send it to louisanisa@gmail.com. Thanks again. P.S. I use your blog all the time for sharing time ideas! I would love to see your program! brittanydunlop@gmail.com Thank you thank you! You are BRILLIANT! I would love a copy of the childrens program that you have done up! Thank you so much for sharing your talents. Thanks :) I just sent you an email. Sent you an email :) Thanks! Love, LOVE your site! Thank you for blessing my life with your incredible talents! I woiuld LOVE a copy of your program!! saracapener@gmail.com! Thanks SO much!!! Thank you Sara!! I Seriously am so grateful for the amazing support and comments :) I have sent you an email. Can I please have a copy of your program mvuataki@yahoo.com. I really appreciate the work you put into your site! I would also love a copy of your program. richey.meredith@gmail.com Thank you in advance! I would also love a copy of your full outline. My email is lisadjudd@gmail.com Thank you so much for sharing!!! Could I please get a copy of the program as well? email britnyfery@yahoo.com Thank you! Yep, sent it to your email :) Thanks! Would you please send me a copy of the full outline? Thanks so much. Thanks for visiting the blog :) And for your sweet comment :) I've sent you an email, good luck with the program. I like how you organized it by class. Will you please email me the full outline! Danita@ottilieID.com Thanks! I would love an outline!!! My email is lrh25@hotmail.com Thanks!!! Thanks :) I've sent you and email. Thank you :) I've sent you the program. Please could you email me a copy badcamelot@yahoo.com. Thank you for all of your work and inspiration! I would love a copy, too. Thank you for offering it! Jennyknight1229@gmail.com. I would love a copy of the program as well!! Great Ideas!!! kristenbunker@gmail.com Thanks so much!!! Thank you so much for these tips! My first attempt at this was deleted and you may have saved me. Can you please email me at VanessaLHansen@gmail.com. Thank you! Like so many have said, your blog is my favorite and first I look at to get inspired for sharing time! Thank you for sharing your talents! Please know you are greatly appreciated! Thank you so much Tiffany!! Your kind words truly mean so much :) I have sent you the program outline in an email. Sent it to you Mandy :) Good luck with your program! I would love to see the entire outline please. ashclarkley@gmail.com. Thank you for posting these ideas. Thanks Ashley!! I just sent you an email. Can you please email the program outline to me? I love having the children answer the questions and would love to see what questions you had! Thank you for all the work you do and being willing to share with all of us!!! jennifer@potabledivers.com Thanks so much!!! Oh thank you so much Mia! You are so sweet :) I've sent you an email. Oh Sue, I am sure you are doing a great job :) I have sent you the program in an email, hope it helps. Thanks Rachel! It really helps things flow with the teachers leading the class up and it helps the teachers be involved. I've sent you an email. 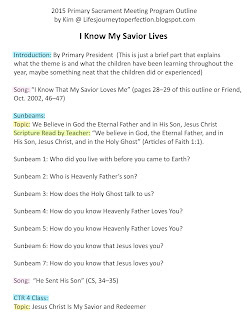 Hello, can you please send me the full outline of 2015 SACRAMENT MEETING PRGRAM? Thank you for sharing your talent to us. I've sent it in an email. Let me know if you have any problems opening it up, Thanks! you can e-mail me at renilisa2191@yahoo.com.ph.....Thank you very much. Thanks for sharing this great program. Could your program cover be sent in a WORD file, by any chance? jsb5775@gmail.com. Thanks. I love this info!! Do you have a program outline for 2016?